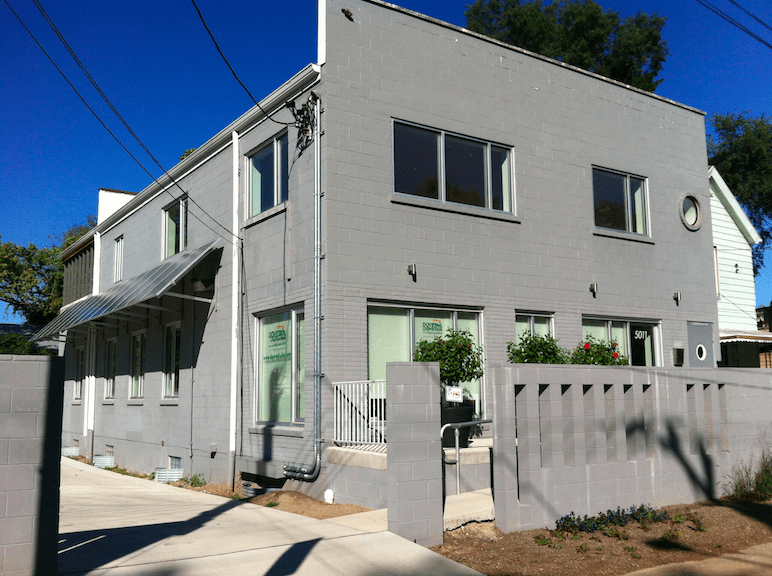 Dovetail Solar and Wind’s office in Madisonville has earned LEED Certification. Dovetail Solar and Wind worked with Chuck Lohre as the LEED AP, Kevin Kluender of Drawing Department Architects, Michelle Andersen of Flourish Landscape Design, Bayer Becker Civil Engineers and KLH Electrical, HVAC & Lighting Engineers to renovate the former grocery store and apartments into office space. Other contributors included: Mike Deming, general contractor; Ryan’s All-Glass, windows, Robert Jones Plumbing; Acanthus Group for interior woodwork; Molloy Roofing; Heine Masonry; Westside Renovators for painting; and HVAC installation, Jonle. Established in 1995, Dovetail Solar and Wind company is now one of the oldest and largest renewable energy firms in the Ohio area. It’s one of the few alternative energy consultants that provides all three major renewable technologies: solar electric, solar thermal and wind. 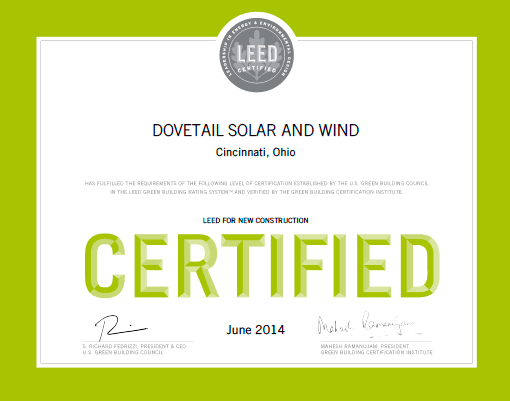 Dovetail Solar and Wind recently added an office in Cincinnati and decided to pursue LEED certification to obtain the LEED tax abatement. The 1955-era masonery building sat empty and dilapidated for decades. Its last use was as a grocery store, which was long gone. But the structure had a solid foundation and a good location, though the interior left much to the imagination. Contractors discovered original hardwood flooring and after applying love, sanding and low VOC sealant, the hardwood floors shine again. In fact, 98 percent of the hardwood was kept in place. Dovetail Solar and Wind used reclaimed oak barn lumber as trim along wall partitions, providing a rustic complement to the hardwood floors. 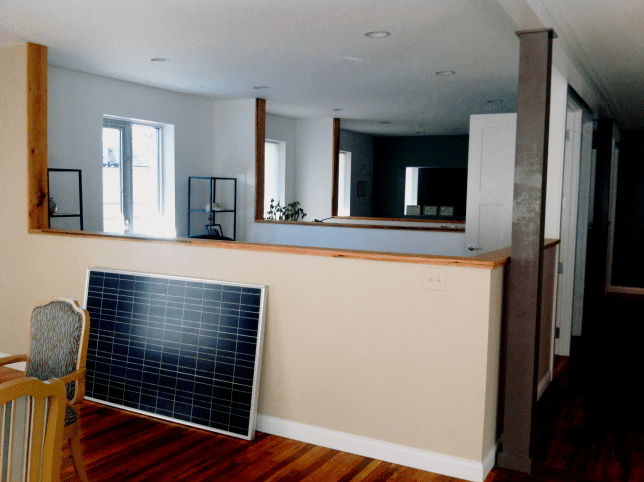 Because Dovetail Solar and Wind is a renewable energy firm, it only made sense to include solar panels. It was a great opportunity to save money and energy while showcasing what Dovetail does best. 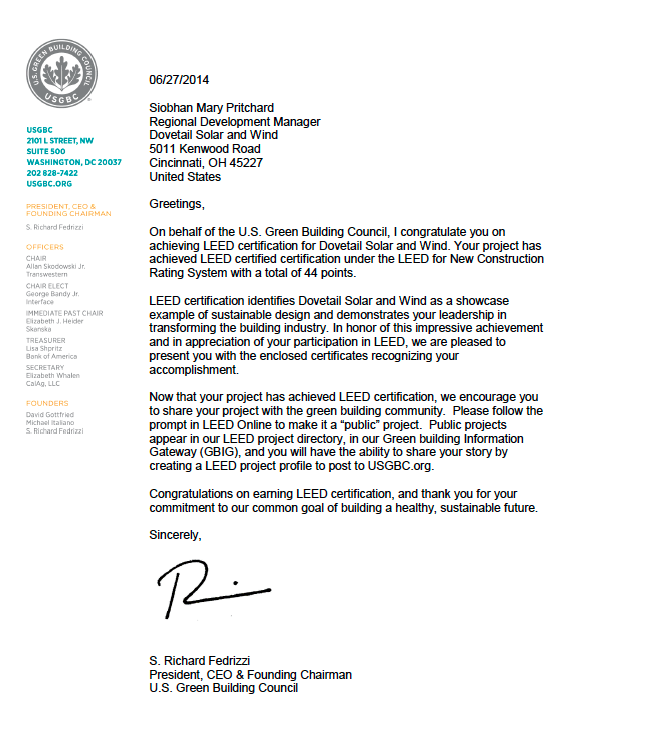 This also contributed to receiving LEED points for onsite renewable energy. Adding LEDs and CFL light fixtures was another easy feat for reducing energy needs. 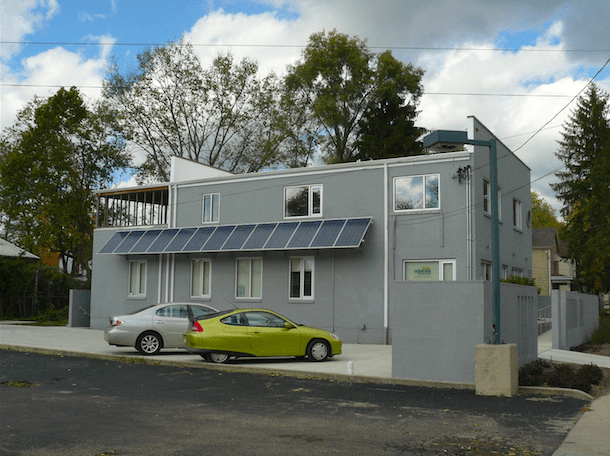 Dovetail Solar and Wind’s location within Cincinnati city limits allowed for development density and community connectivity credits. Situated on the main drag of Madisonville, a walkable historic city neighborhood planned before the advent of automobiles, the community is well served by public transportation making those credits achievable. Civil Engineer: Michael Dooley and Greg Kock, Bayer Becker, Inc.